It’s one of the weirdest animals I’ve ever seen, and I’ve seen a lot of weird critters here at PopFi. Residents in a Venice, Florida neighborhood have a new face on the block. 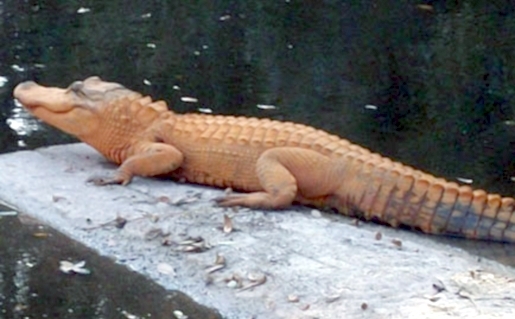 An orange alligator has taken up residence in a Florida subdivision. No one is more surprised than neighbors and local officials, who say they have never seen an orange alligator before. Unfortunately, officials from the Florida Fish and Wildlife department believe that the orange gator isn’t actually orange. “The official opinion from our alligator experts is that this is alligator is not naturally orange. We believe it’s orange from paint, stain, iron oxide or some other element in the environment that has left a coating on the animal, making it appear orange,” said spokesman Gary Morse. If it’s just an orange glaze, they did a great job coating the gator with it. Or I guess the gator did a good job coating himself, since normal people won’t get close enough to a gator to hang out with him. Another theory is that the animal is partially albino.